I got sick the weekend before school started. I didn’t go to the doctor, but I had something that resembled a sinus infection. It wasn’t fun. I spent a few days in bed watching shows on Hulu and eating pieces of bread. 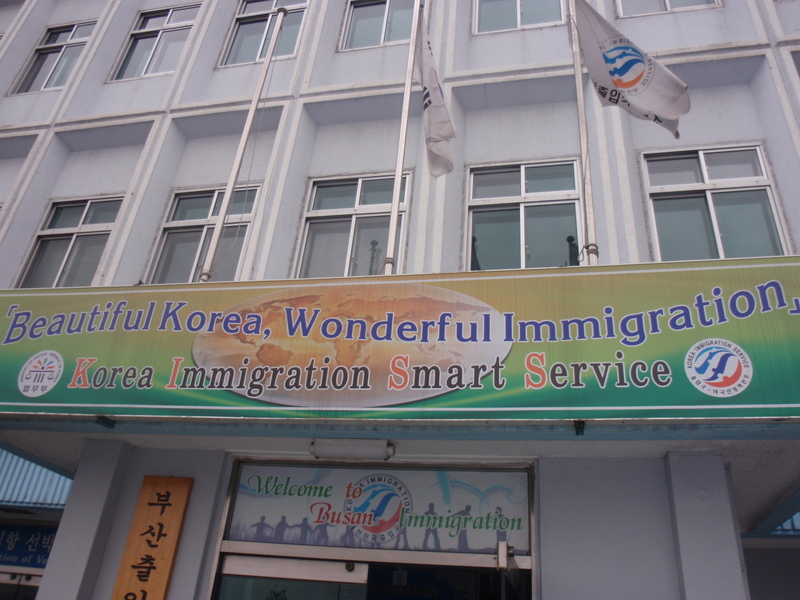 On Monday I met up with my co-teacher to go to the immigration office to apply for my Alien Registration Card (ARC). I saw quite a few people there that I had met at orientation. When you walk in you have to take a number, then go fill out the application form. The place was packed, but the line was moving really quickly and we were in and out in about half an hour or so. There was no school on Tuesday because it was Korean independence day. School officially started on Wednesday. The day was quite interesting. Let me start off by saying that I was a bit embarrassed on the first day. At school the first thing we do when we come in is change our shoes. We wear slippers or indoor shoes all day and then we change our shoes when we leave the school. I didn’t feel well on the days leading up to school starting so I never ventured out to buy slippers for school. The only shoes I had to wear were the two pairs of slippers that my co-teacher gave me to wear in my apartment. I decided to wear my shower slippers. I think the teachers got a good giggle out of that. I definitely brought different shoes for my second day on the job. The first thing I did on Wednesday was go to the Broadcasting Room with all of the new teachers at the school. 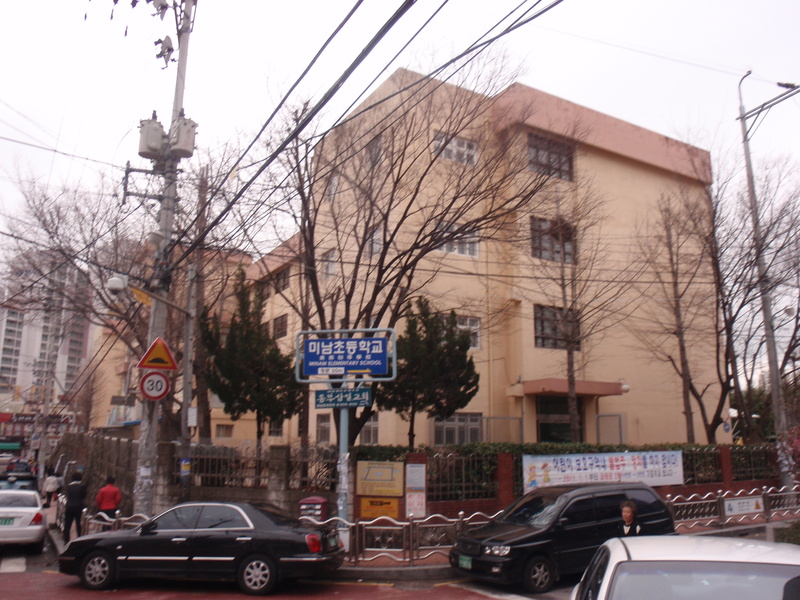 The principal announced us all, one by one, in Korean. I wasn’t really sure what to do so I just followed the lead of the other teachers. The tricky part was knowing when to bow. All of the other teachers could understand what was being said, but I just had to listen closely and try to find a cue word to tell me when would be an appropriate time to bow. I think I did okay. I ended up doing two bows. It was a little awkward, but I wasn’t the only teacher that did that so I don’t feel too bad about it. Next, I had to help with the first day of school ceremony. Some students came out in matching outfits and sang and danced to some really cute songs, then the principal and vice principal said some words. All I really know is that I was in charge of handing out balloons to a class of 6th graders so they could pass the balloons to the incoming 1st graders. I was a little afraid that I was going to lose my grip and all of the balloons were going to fly through the air, but I only ended up losing one. It wasn’t really my fault… the string was really short and when what I assume was the Korean national anthem started playing, I wasn’t sure what I, being a foreigner, was supposed to do with my hands. Anyway, when it was finally time to hand out the balloons, I must have been going too slow because 4 other teachers rushed to my aid to hurry along the process. All in all, the ceremony was pretty neat. After the balloons were handed out, they were released into the air. The ceremony is supposed to welcome the 1st graders into the school. I am pretty sure the students were allowed to leave school after that. It was an easy day. It was recommended to us at orientation to make PowerPoint presentations (PPTs) introducing ourselves and our country. A lot of my friends had prepared theirs before school started. I am so thankful that I didn’t because that was basically the only task I was given to do all day Wednesday. I couldn’t imagine what I would have done if I didn’t have that to work on. I was bored enough as it was! Lunch time was a little confusing for me. My co-teacher told me it was time for lunch and then we started down the stairs. She acted like I was silly when I didn’t change out of my slippers. Honestly, I had no clue what was going on. I was a little confused, but I changed out of my slippers and then all of the teachers started leaving school. I was informed on the way that on the first day of school all of the teachers go out to eat. My co-teachers asked me if I had ever eaten tofu and they were excited when I said I had. They explained to me that we would be eating beef stew. I was a little nervous because I would be eating in front of all of my co-workers, including the principal and vice principal. As soon as we walked in, the restaurant greeted us with a really pungent smell. I later found out it was some sort of fermented bean soup that is supposedly very good for you. I don’t doubt it, but I have noticed that people in Korea say lots of things are very good for you. We walked upstairs and had an entire room to ourselves to eat. We all took our shoes off and sat on the floor at long tables. Each table had a burner and was full of side dishes. The beef stew that my co-teachers told me about turned out to be seafood stew. It had all sorts of sea creatures in it, like shrimp and octopus (tentacles and all) and other things that I couldn’t identify. If you didn’t already know, I do not like seafood. I mostly ate rice and mixed a bit of the broth in to help the seafood stew go down a bit easier. I sat across the table from my principal. He was very interested in how I liked the food, as was everyone else. It wasn’t bad, but I’m sure I would have eaten more if it wasn’t seafood stew. I did end up trying the bean stuff. It tasted a lot like it smelled so I only had a few spoons full. At lunch I was asked by two different people if I am good at/like to play volleyball. The answer to both is no, but I agreed that I would play with everyone. I didn’t realize what I was getting myself into. I later found out from other people that have already worked in Korea for a year that the elementary school teachers take their volleyball pretty seriously. They have matches against other schools and they are super competitive. I just thought it was for fun. I am wondering if I can retract my offer to play. I am not the competitive sports kind of girl. My hand-eye coordination is pretty much nonexistent. I don’t want to seem antisocial, but having me on the team doesn’t seem like a very good idea. I spent the rest of the day in the teacher’s lounge/office working on my PPT. I was having a difficult time figuring out how I was going to talk about myself for 20 minutes. Lots of my co-workers were interested in my PPT and wanted to see it. They were a bit disappointed because I had to finish the PPT at home. The pages about my family didn’t have any pictures on them yet because all of my family pictures were at home on my laptop. I work Monday through Friday from 8:40am to 4:40pm. My school is just a 10 minute walk from my apartment, which is nice. Mary, I know you’ve been asking about the food we were eating at orientation was, but the truth is, none of us really knew. They didn’t label any of the food so we really just had to get food and guess what it was. Most of the food was a bit cold and I really didn’t eat a whole lot at orientation. This entry was posted in Teaching English in Korea and tagged ARC, Busan, elementary, EPIK, ESL, first day, food, Korea, school by Meagan & Dave | HappilyEverExpat.com. Bookmark the permalink. What great experiences. You go girl! Was thinking about you and the nuclear explosions/radiation leaks in Japan but Tim said that the trade winds should pull all of that out to the east – out to sea. Whew, just praying for everyone over there… You should be safe though. Yes, let them know that you don’t care for seafood! Then they will steer you toward the food you like; how long can you eat just bread? Just going to play your mom for a moment. Are you taking vitamins? If not, you need to get some, dear! Wow, every day you will learn something new and different! What a great experience! Keep your good attitude, Meagan. Love hearing the stories!